During the height of the Cold War there was a very real and present danger of a war between the USA war and Soviet Russia. A product of such fears was the 1984 Patrick Swayze and Charlie Sheen staring Red Dawn and a Soviet invasion of the US Homeland. A plucky all American band of teenagers come together to fight the Russian baddies who are attacking the American goodies way of life. Flash forward to 2013 and the USSR is no more. The fourth largest army in the world is now that of Communist dictatorship led North Korea and this is the jumping off point the remake by director Dan Bradley of Red Dawn uses to create it's new version of an imagined invasion on US soil - this time it's the North Koreans. The new group of plucky American teenagers is led by Chris Hemsworth as Jed Eckert. Thor-made-flesh is a marine home from duty in the mythical land of 'Overseas.' Home now consists of his externally confident, headstrong younger brother Matt (Josh Peck) with the brothers estranged though kept together by their local police officer saintly widower father. The film opens with Matt going against the advice of his coach and team in his High School's football game. He does however, have the consolation of an adoring pretty blonde haired cheerleader girlfriend who has a car most hard working Americans could only dream of possessing. 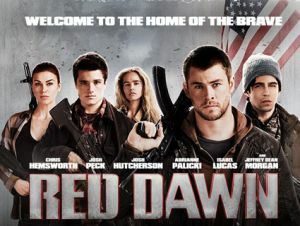 With all of their American credentials in place, Red Dawn (2012) quickly gets to the main action. The North Koreans impressively invade middle America and a small band of locals, led by Jed escape to a cabin in the woods. Sadly this does not segue into a sequel to the marvellous The Cabin in the Woods. 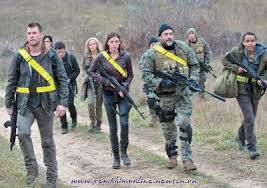 Instead it is the beginning of the guerrilla unit Jed puts together which includes his potential love interest Toni (Adrianne Palicki), handily technical Robert (Josh Hutcherson - no stranger now to surviving in woods from The Hunger Games) along with a handful of others including Connor Cruise as Daryl. Tom Cruise's son makes his first foray into action films and does so as quietly as possible in an underwhelming performance. With one quick piece of narration by Hemsworth his team, now using the High School teams' nickname The Wolverines are causing all sorts of disruption to Captain Cho (Will Yun Lee). The North Koreans are depicted as skilled decorators but as an invading force are completely unobservant and continuously lax when it comes to basic security. Do the brothers resolve their differences? Does Matt rescue his poor weak, captured blonde girlfriend and learn what it is to be a team player? Does the American way prevail? Totally Dude but not after a surprisingly pleasing twist in the fortunes of the team. Red Dawn is certainly not going to bother other Oscar contenders in the coming year but it does show just how charismatic and great an actor Chris Hemsworth is in his ability to bring quality even to the most risible and mediocre of scripts. This is none more in evidence when his speech to his troops at the start of their campaign is repeated by his lesser acting on-screen sibling Josh Peck. There are some outstanding completely unintended laugh out loud moments in RedDawn which FilmLandEmpire would have you enjoy only if you happen to stumble upon a TV screening of this film in the future. Please don't spend any of your hard earned cash. Instead, perhaps invest in some Korean language lessons, because if North Korea see this film, it might just spark World War 3.